It’s a sunny, springtime day in subtropical Brisbane and we are heading towards Mt Coot-tha, the ‘mountain’ which is really a hill. The temperature is balmy and the drive is easy, out along a flat highway which decimated countless trees and native bushland. Mt Coot-tha “Summit” Restaurant & Bar. We cruise by the Botanical Gardens, the Planetarium, the quarry (! ), the cop with a radar speed gun, the tourists in an overheating VDub Kombi-van and climb towards the summit lookout which sits atop what was colloquially known as ‘One Tree Hill’. Plenty more trees now, well, there is at the moment but Brisbane City Council may revert to one. The council is keen to upgrade the area, adding tourist lures like a zipline and tree-top canopy walk. Bye-bye quiet little harmless native animals and birds who take sanctuary there from the six-lane highway below. Lunch in the shade of Kuta Café atop Mt Coot-tha, Brisbane. Hardy plants in the sun all day. We reach the carpark of our destination, fluke a spot, and notice the air smells eucalyptus fresh. It’s an interesting walk through various nationalities of smiling, picture-taking tourists. We join the milling crowd and peruse the Summit Restaurant & Bar menu before deciding the dollars signs are for high class meals. It is easier to tag onto the lunchtime queue at Kuta Café with its two-tiered eating decks. Old natural stone from the surrounding area. View from almost the top tier of the lookout. I enjoy a delicious chicken salad wrap and share a huge bowl of baked potato wedges with heaps of sour cream and sweet chill sauce. After keenly snapping views towards the river and western suburbs, Brisbane CBD, and Moreton Bay with Moreton Island sandhills way in the distance, we detour the gift shop and head back to the car. A friendly magpie lands on the car mirror, enquiring about food, but we have none to give, so it takes off—see below for this gripping encounter. The Xanthorrhoea plant is uniquely Australian. It grows in the South East of Australia thriving in well-drained, aerated soils with low nutrient content. Sticky-beak Magpie looking for food. We agree not to drive the long way, the full circuit around Sir Samuel Griffith Drive which passes leafy barbecue areas, transmission towers and headquarters of local television stations. 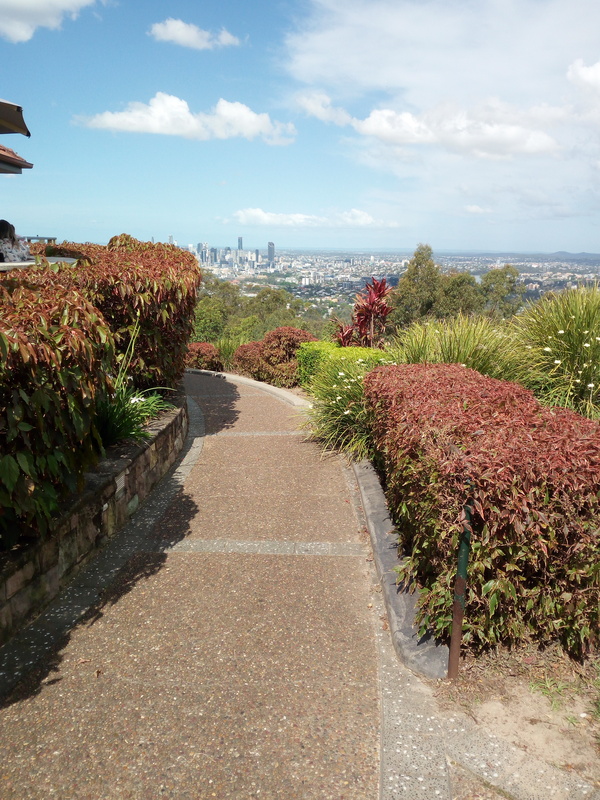 Heading down the hillside, the city views and far-reaching scenery becomes less and less until ground level, then the highway roundabout appears, perfectly positioned opposite Toowong Cemetery. The City of Brisbane is growing, the traffic is growing, the drivers are getting faster. Or am I turning into a grumpy older person? Time for a nap!